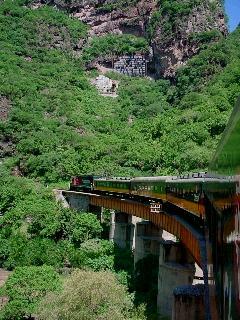 A 'Soft Adventure' trip to the rim of Copper Canyon by Train. 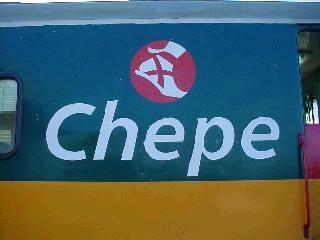 Day 3 - September 6, 2003 - Chepe (Chihuahua Pacific Railroad) train trip to Copper Canyon. 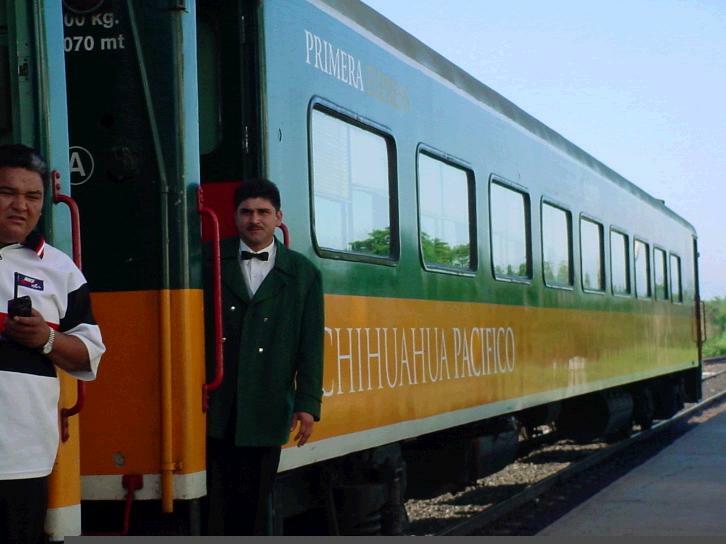 Today would be our first sight of the Chihuahua - Pacific Railroad and its Copper Canyon Express Train. 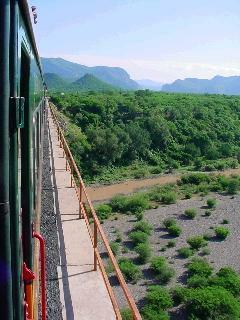 A modern, air-conditioned bus took us from the Posada Del Hidalgo hotel in El Fuerte to the train station outside of town about a mile. 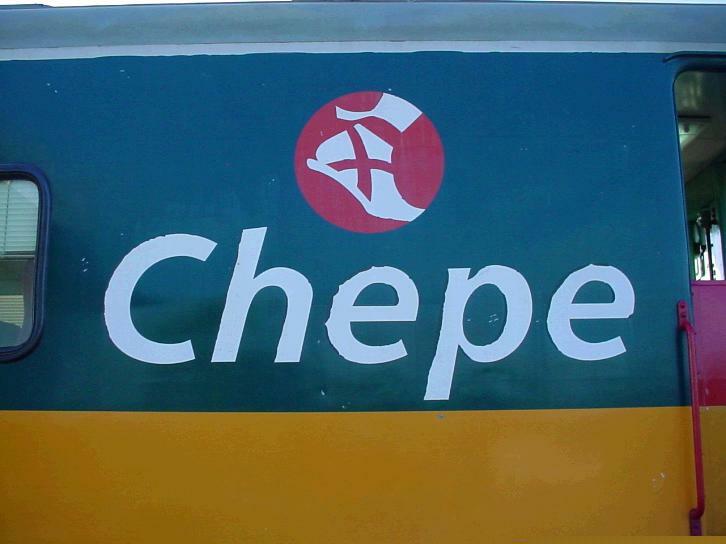 For the History, Facts, and Tips of the Chihuahua - Pacific "Chepe" Railroad, Click Here. You can click back to this page following the link at the bottom of the History...page. Our group of 40 had the entire last car to ourselves. 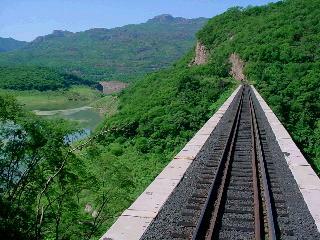 Flat terrain before the mountains. 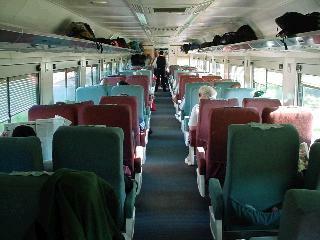 Our First Class coach car, excellent accommodations. 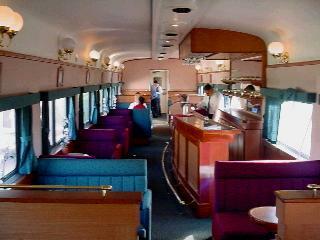 The other two cars on this 4-car train were the bar car (above) and dining car. 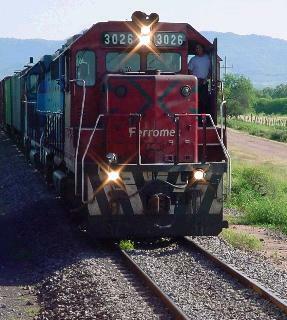 Soon we met a freight, we took our shorter train onto the siding, never stopping and continuing back on the main track after the freight passed. 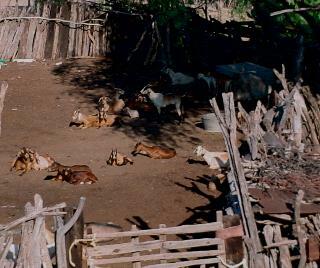 Goat herders make better money than Tour Guides, according to our guide, Carlos. 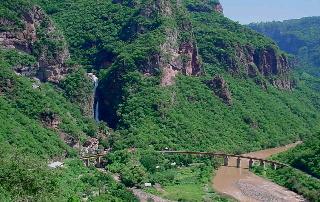 It was not long until we began crossing the first of the 37 bridges on the route from Los Mochis to Chihuahua. 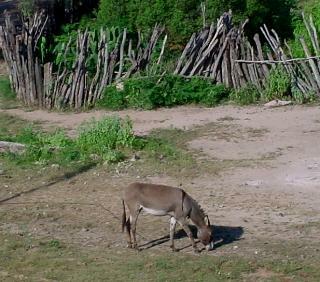 Burros are descendents of the one Mary rode, note the cross on the back going down the shoulder. 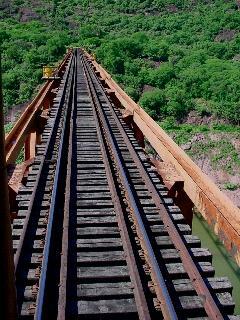 Soon we cross the first of 37 bridges built on this line. 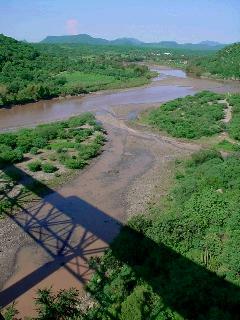 Our shadow details the bridge's construction on the riverbed below. 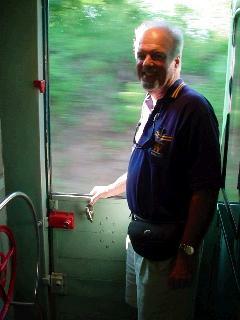 Partner, Don Roe, enjoying the "Open Door Policy." 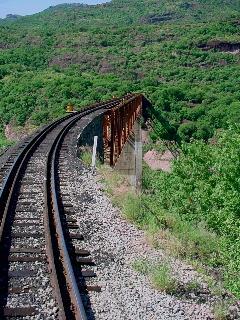 Another bridge of different construction. 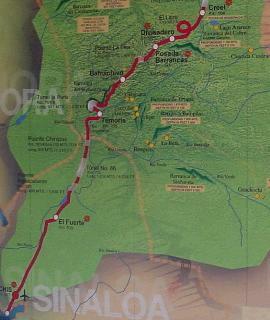 This section of the Chihuahua-Pacific Railroad gets the most press with three levels of track starting with our train on the low bridge followed by the La Pera (Pear) Tunnel, (3,074 feet long) which does a 180 degree turn inside the mountain. 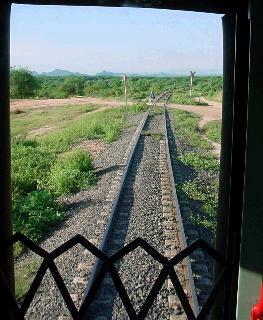 If you are watching the valley when entering, don't forget to look out the opposite side of the train for the valley view when you exit the tunnel since you won't feel the turn in the dark. 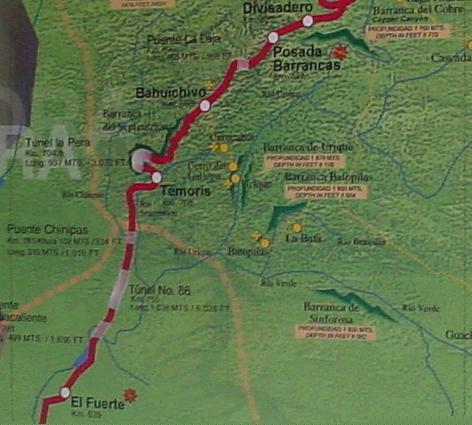 Other tunnels and bridges are involved in this extensive elevation change for the tracks. 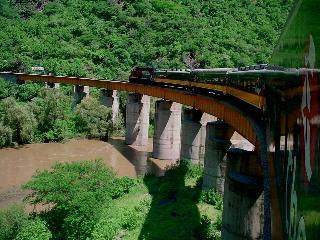 Our entire 4-car train on the long bridge over the river, continuing up 2 more levels to the monument, through a tunnel, and out of this canyon. 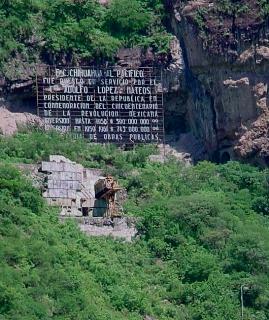 The monument above our train on the Fuerte River bridge. Looking back from the 3rd and final level to a waterfall and the river bridge we had crossed earlier. 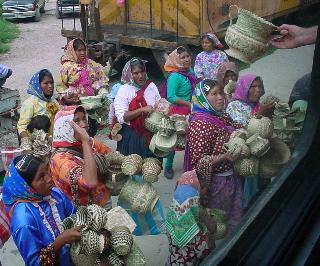 Tarahumara Indian basket vendors at San Rafael. 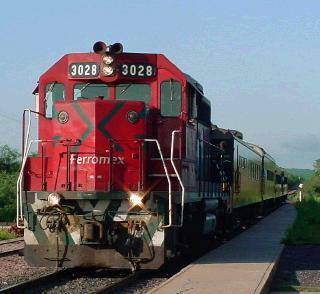 San Rafael is the usual meeting place of the east-bound and west-bound Express and Economy trains daily, and a crew-change spot. 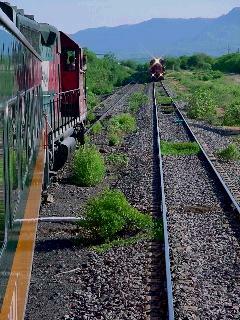 Thus the number of vendors who appear at all the trains to sell their baskets. 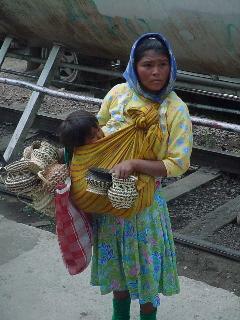 Indian women selling Apache Pine needle baskets at the San Rafael Station while the train crew is changed. 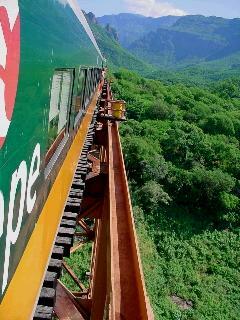 Shy mother on the opposite side of the train. 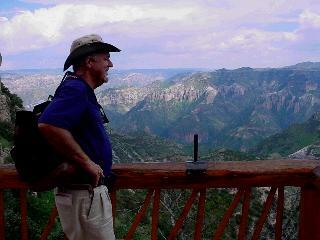 The average age for the Tarahumara Indian girls to wed is twelve! If they are lucky, they have gone to the girls boarding school and learned basketweaving using the long needles of the Apache Pine tree. 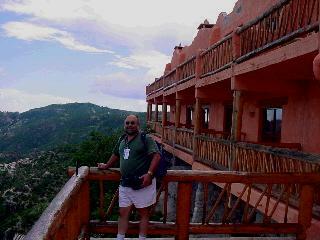 View from the Posada Mirador Hotel lobby porch. Don and east-facing room balconies. 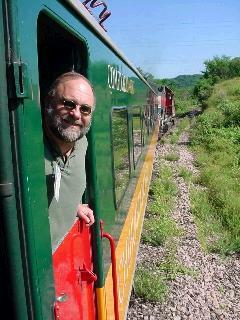 Click here for the Next Segment of this Travelogue.